Outside of the box, there are a few, select things your coaches love. Things that we live for. Things that we are willing to travel all the way across London to sample. These include good food (especially steak), flavourful craft beer and – the topic for this blog – a perfectly constructed cup of coffee. I was raised on Folgers freeze-dried, survived university on Starbucks tall mochas with extra whipped cream and now, in my more mature years, I love sitting down to a cup of expertly brewed black coffee in my d'Ancap cup (or my Mr Tea Rex mug, on special occasions). 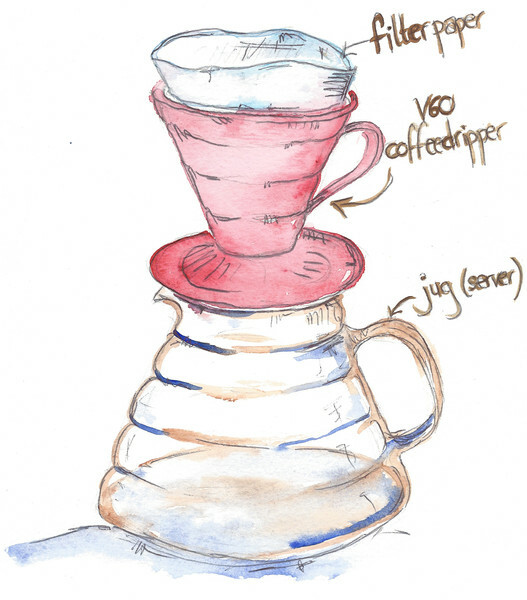 Why use a V60? The conical, V-shape (hence the name) and ridges on the filter allows for the coffee to drain evenly into your cup, ensures the water stays in contact with the ground beans for longer, and most importantly, gives the coffee a chance to breathe, all of which leads to a well-rounded, flavourful and flippin' tasty cup of joe! Furthermore, there is nothing more therapeutic than slowly pouring your perfectly heated water over 24 grams of aromatic ground coffee and creating that beautiful bloom. When we’re out and about, we seek out the best drip, aeropress, flat white and cold brew offerings in London, from Climpson and Sons on Broadway Market, to Attendant by Tottenham Court Road; Craft in Shoreditch to Dose by the Barbican. A while ago we posted a short list of some of our favourite spots and a brief note on why we like them so much. Here is version 2.0 of that blog, with a few additions! Don't see your regular below? Comment and let us know where it is and why it makes the grade. As a Londoner who enjoys coffee, you kinda have to go to Monmouth. It’s like a coffee lover’s gateway into exploring all of the great coffee spots Londontown has to offer. There is a great variety of coffee, the staff are very knowledgable, but unfortunately, it’s almost always PACKED. Bro tip: if you buy beans to take home, you can join the much shorter queue. Try a few free samples of different coffees, get your beans and grab a coffee to take away as well. Boom to the sauce. Monmouth’s proximity to Utobeer = added bonus. Workshop is a perfect late afternoon coffee spot, which is both a bar and a cafe. Sit at the bar and you can get a front row seat to the action: Workshop roasts their own beans on-site, right alongside their diners. If you find yourself around Oxford Circus, Workshop has also recently (-ish) opened a new coffee bar on Mortimer St. This is much smaller than their Clerkenwell branch, but the smaller space leads to a cosier atmosphere and their staff love having a chat with you about the coffee! The attention to detail paid by the owners of this unexpected gem near Battersea is second to none. In the Queenstown Road train station, this cafe is the commuting coffee connoisseur’s dream come true. Grab a coffee on your way to Battersea Park, enjoy the mind-boggling amount of information the owners can provide about their coffee and, whatever you do, don’t put your coins on the glass counter! Ozone is one of my favourite places to work from home, away from home (I'm actually writing this blog, sitting in Ozone at this very moment). Not coffee-related, but important - they have free fast Wifi and a plethora of outlets to charge your laptop! Their coffee (roasted downstairs) is beautiful and exactly what you would expect from a cafe with New Zealand roots and their breakfast – particularly the eggs benedict with bubble and squeak cakes – is everything you could ask for for a great start to your day.